SHOFAR: The shofar is a ram’s horn which is blown somewhat like a trumpet. One important observances of this holiday is hearing the sounding of the shofar. A total of 100 notes are sounded each day. There are four different types of shofar notes: tekiah, a 3 second sustained note; shevarim, three 1-second notes rising in tone, teruah, a series of short, staccato notes extending over a period of about 3 seconds; and tekiah gedolah (literally, “big tekiah”), the final blast in a set, which lasts (I think) 10 seconds minimum In many Jewish communities the shofar is not blown if the holiday falls on Shabbat (the Sabbath). TESHUVAH, TEFILAH AND TZEDAKAH: New Year is a time to plan a better life, making “resolutions.” Rosh Hashanah is a time to begin introspection, looking back at the mistakes of the past year and planning the changes to make in the new year. It is a time to apologize to others for any offenses and resolve to do better next year which is called teshuvah. Then it is a time for tefilah, prayer and tzedakah, good deeds and charity. TASHLIKH: A popular practice of the holiday is Tashlikh (“casting off”). We walk to flowing water, such as a creek or river, on the afternoon of the first day and empty our pockets into the river, (today we use bread crumbs) symbolically casting off our sins. This practice is not discussed in the Bible, but is a long-standing custom. FOOD: A favorite Rosh Hashanah tradition is eating apples dipped in honey, a symbol of our wish for a sweet year. Bread is also dipped in honey or sugar and we eat sweet foods in general at this time of year for the same reason. 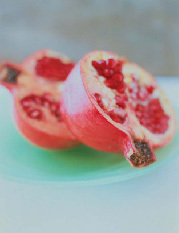 Some Jewish cultures have a special Rosh Hashanah meal with symbolic foods for a good year: pomegranates are most popular, the many seeds symbolize our blessings and a hope that “our merits will be increased like the seeds of a pomegranate”. Other symbolic foods include, dates, beans, greens, carrots, the head of a lamb and fish to symbolize different aspects of good fortune and avoiding harm. This entry was posted in Holidays, Rosh Hashana. Bookmark the permalink.